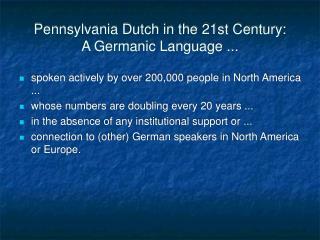 Pennsylvania Dutch in the 21st Century: A Germanic Language . 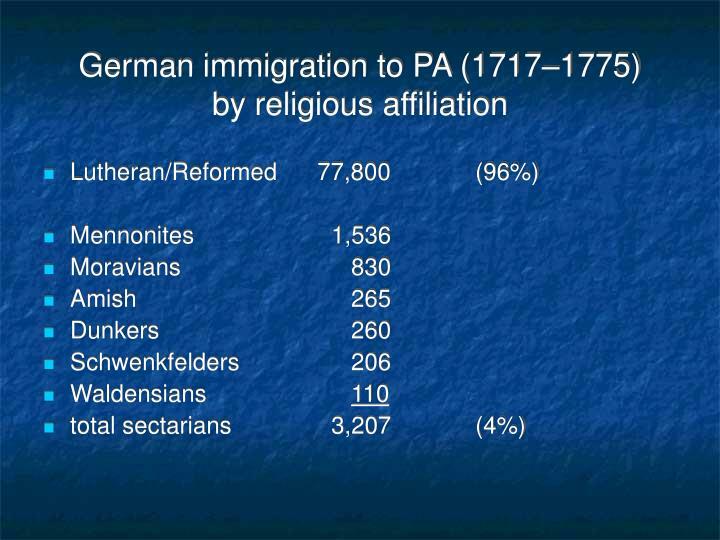 spoken actively by over 200,000 people in North America ... whose numbers are doubling every 20 years ... in the absence of any institutional support or ... connection to (other) German speakers in North America or Europe. 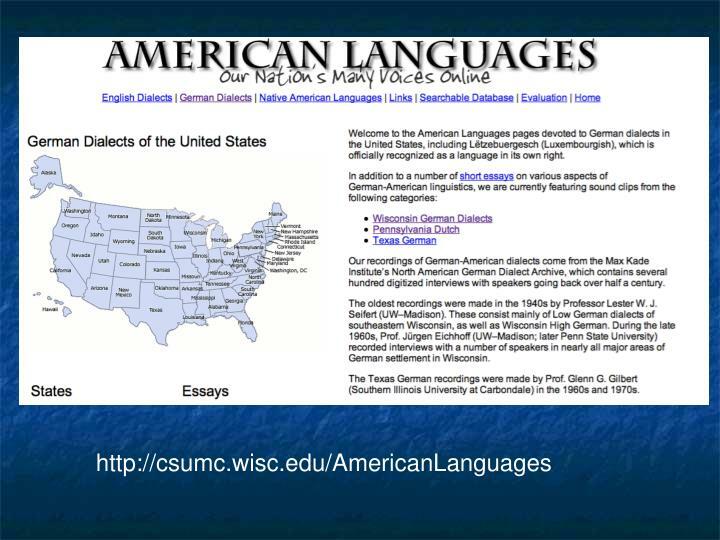 connection to (other) German speakers in North America or Europe. 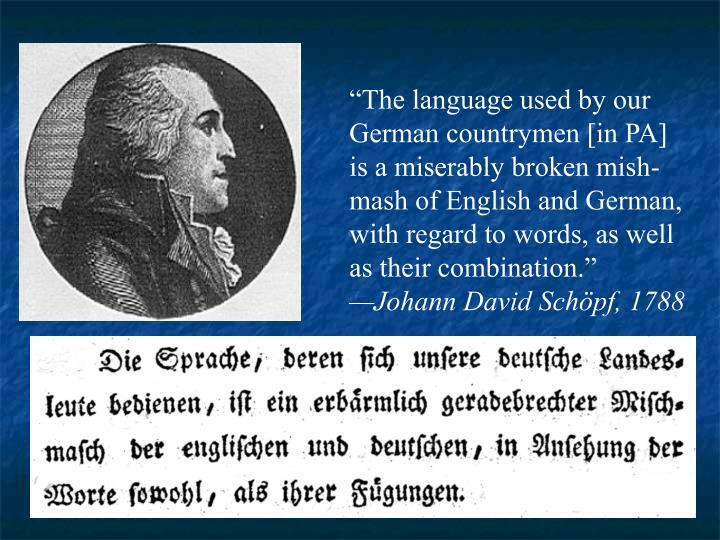 Though many speakers have had receptive knowledge of written standard German, that language has played no role in the genesis and development of PD. 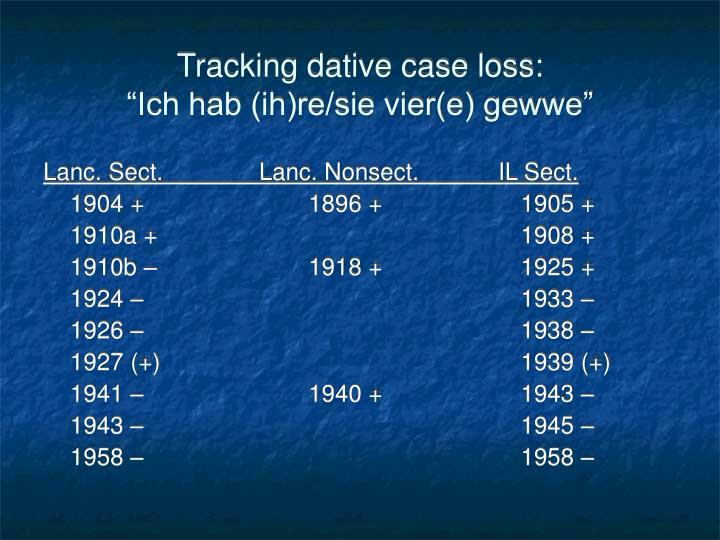 Evidence: No non-Palatine dialectal lexical items in PD. 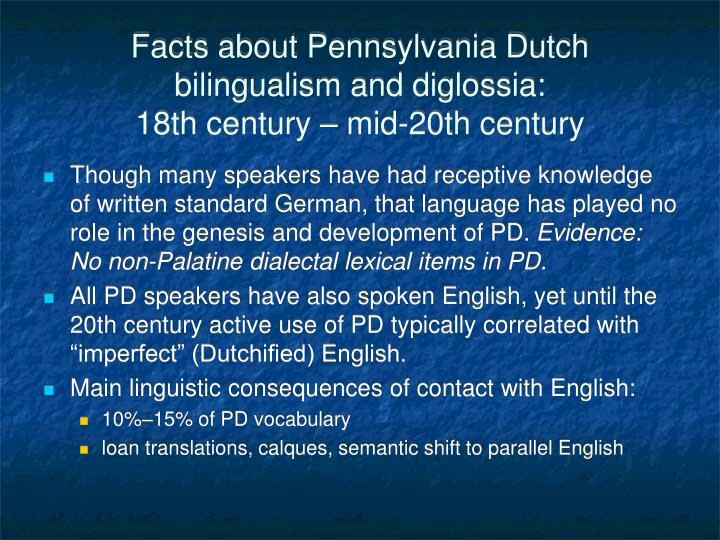 All PD speakers have also spoken English, yet until the 20th century active use of PD typically correlated with “imperfect” (Dutchified) English. After ca. 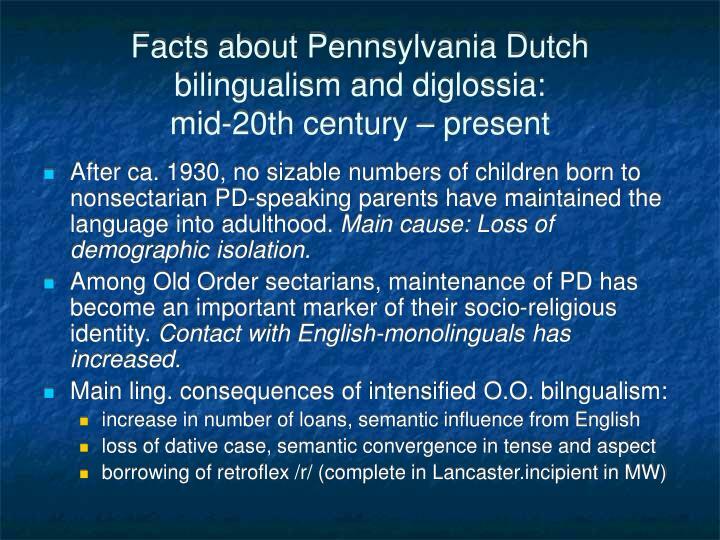 1930, no sizable numbers of children born to nonsectarian PD-speaking parents have maintained the language into adulthood. Main cause: Loss of demographic isolation. Among Old Order sectarians, maintenance of PD has become an important marker of their socio-religious identity. 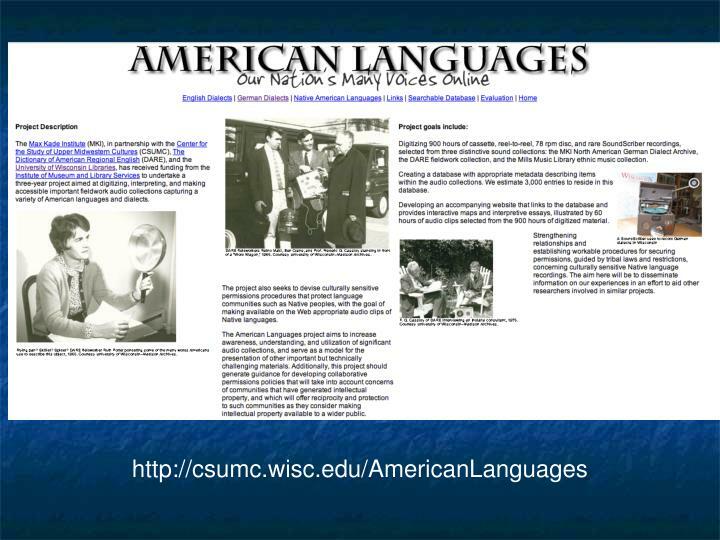 Contact with English-monolinguals has increased. Lanc. Sect. Lanc. Nonsect. IL Sect. So, I might tell you about the German lady that ... I should say it in Dutch? 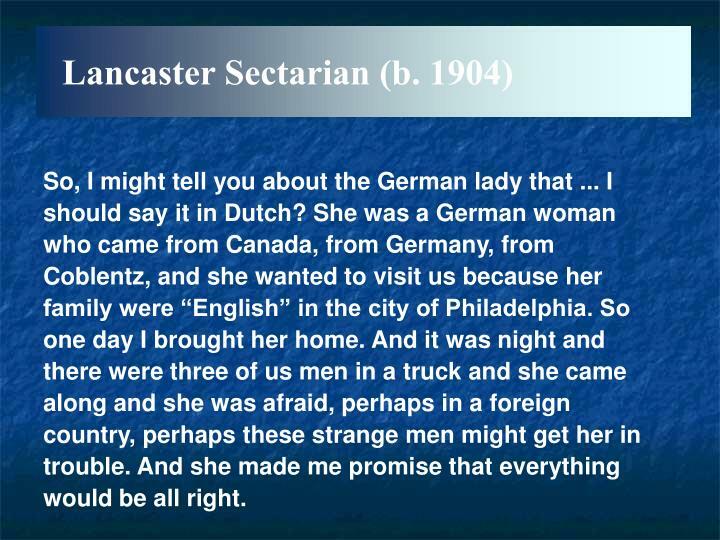 She was a German woman who came from Canada, from Germany, from Coblentz, and she wanted to visit us because her family were “English” in the city of Philadelphia. So one day I brought her home. And it was night and there were three of us men in a truck and she came along and she was afraid, perhaps in a foreign country, perhaps these strange men might get her in trouble. And she made me promise that everything would be all right. 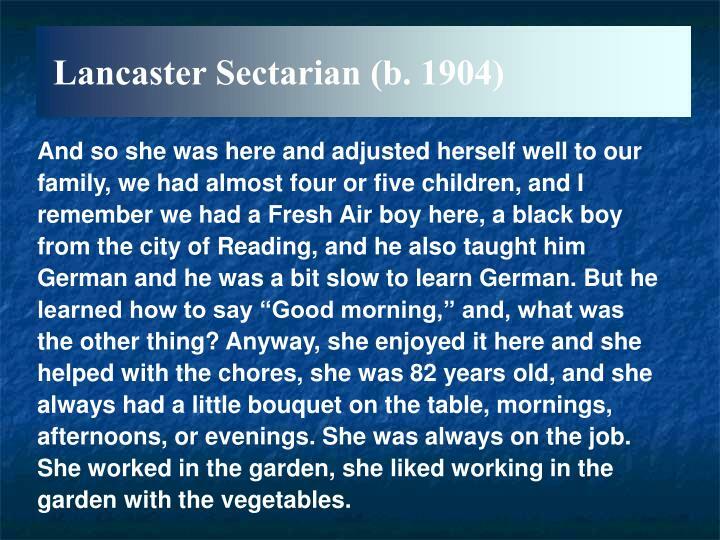 And so she was here and adjusted herself well to our family, we had almost four or five children, and I remember we had a Fresh Air boy here, a black boy from the city of Reading, and he also taught him German and he was a bit slow to learn German. But he learned how to say “Good morning,” and, what was the other thing? Anyway, she enjoyed it here and she helped with the chores, she was 82 years old, and she always had a little bouquet on the table, mornings, afternoons, or evenings. She was always on the job. She worked in the garden, she liked working in the garden with the vegetables. And on Sundays she always wanted to got to church, she was a Christian. And I would always tell here where the text was in her German book, her German Bible, she said oh, she knew it. 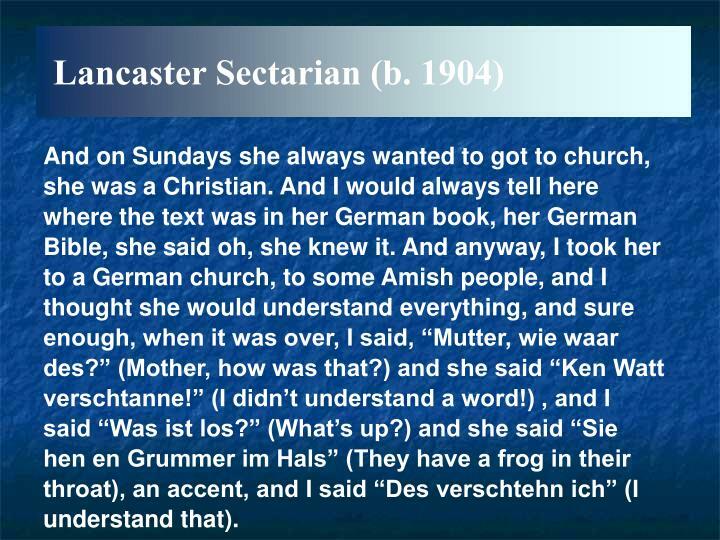 And anyway, I took her to a German church, to some Amish people, and I thought she would understand everything, and sure enough, when it was over, I said, “Mutter, wie waar des?” (Mother, how was that?) and she said “Ken Watt verschtanne!” (I didn’t understand a word!) , and I said “Was ist los?” (What’s up?) and she said “Sie hen en Grummer im Hals” (They have a frog in their throat), an accent, and I said “Des verschtehn ich” (I understand that). 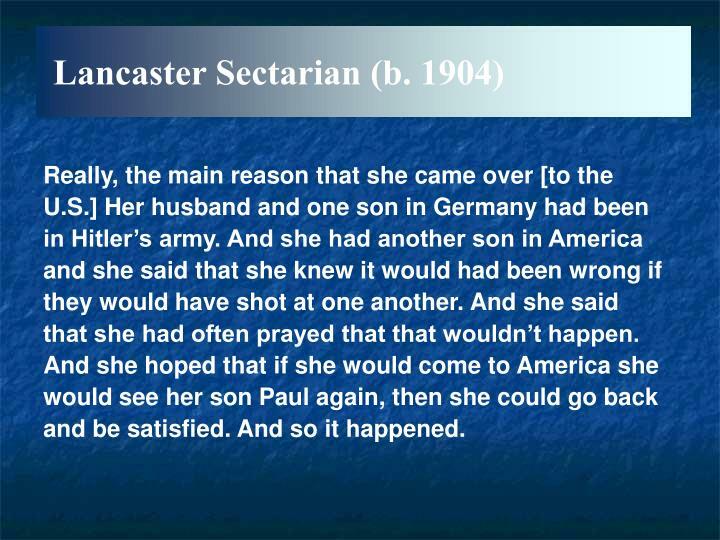 Really, the main reason that she came over [to the U.S.] Her husband and one son in Germany had been in Hitler’s army. And she had another son in America and she said that she knew it would had been wrong if they would have shot at one another. And she said that she had often prayed that that wouldn’t happen. And she hoped that if she would come to America she would see her son Paul again, then she could go back and be satisfied. And so it happened. Anyway, I told her that if she were a Christian, she wouldn’t have had to be afraid about that because Christians wouldn’t shoot at one another. 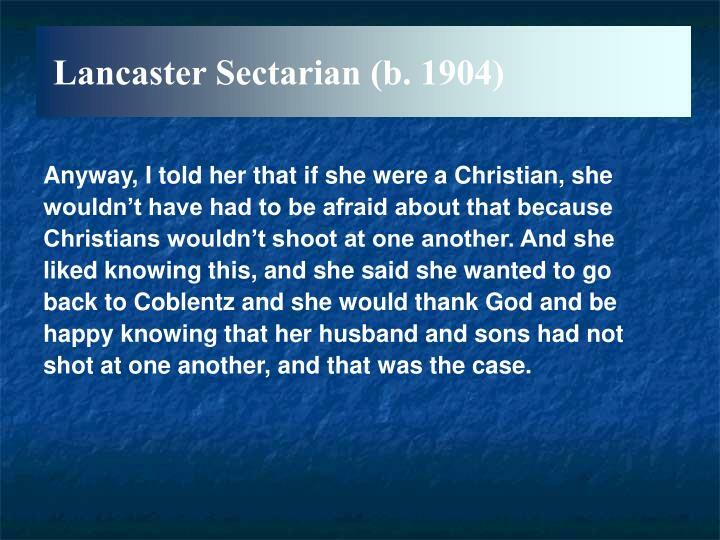 And she liked knowing this, and she said she wanted to go back to Coblentz and she would thank God and be happy knowing that her husband and sons had not shot at one another, and that was the case. Anyway, she was here for four weeks, and then she went home to Philadelphia to her son for a week, and then she came back [here] again, and then she stayed possibly another two weeks, right? Three. Three weeks. 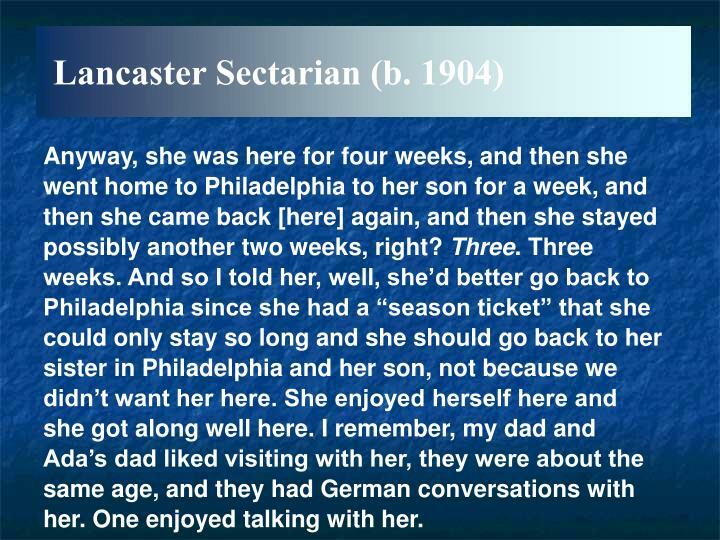 And so I told her, well, she’d better go back to Philadelphia since she had a “season ticket” that she could only stay so long and she should go back to her sister in Philadelphia and her son, not because we didn’t want her here. She enjoyed herself here and she got along well here. I remember, my dad and Ada’s dad liked visiting with her, they were about the same age, and they had German conversations with her. One enjoyed talking with her. I remember the Second [World] War from when I was young, when I was still at home. My dad read the newspaper and they talked about it and I remembered some of that. So, then, when I got older, I took an interest in it, and naturally since I had an interest in history and perhaps for the reason that I had a German background, I was interested in the Second [World] War from the German side. 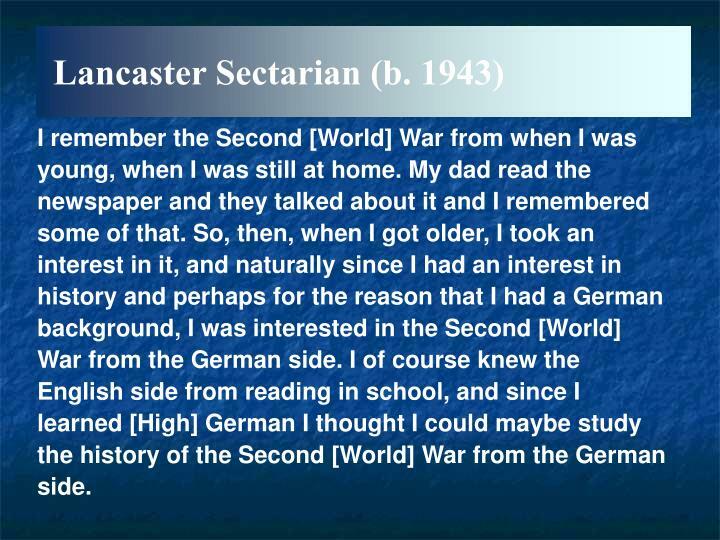 I of course knew the English side from reading in school, and since I learned [High] German I thought I could maybe study the history of the Second [World] War from the German side. And so I bought several books about the Second [World] War and I read a bit about how it looked from the other side, and it wasn’t that much different from what I had learned, except when we read about it in school, we were on the winning side, always the side that won, and that’s the way we used to read about it. 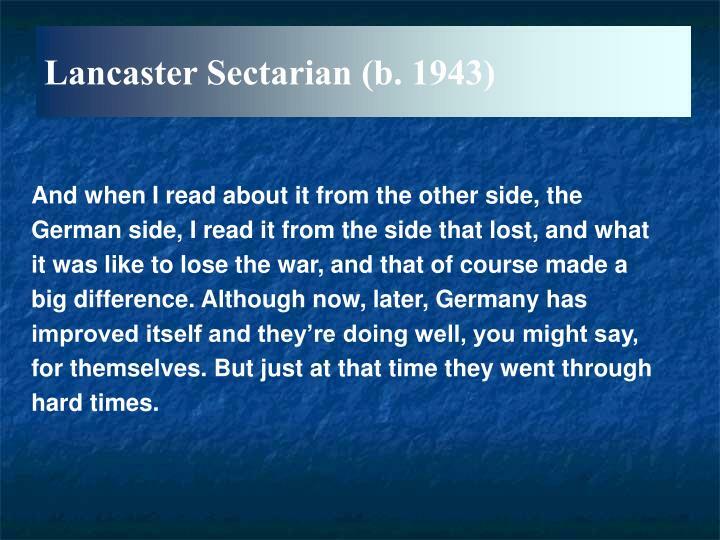 And when I read about it from the other side, the German side, I read it from the side that lost, and what it was like to lose the war, and that of course made a big difference. Although now, later, Germany has improved itself and they’re doing well, you might say, for themselves. But just at that time they went through hard times. We here at home didn’t experience much, those were good times for farmers, during the Second [World] War, because prices were good. 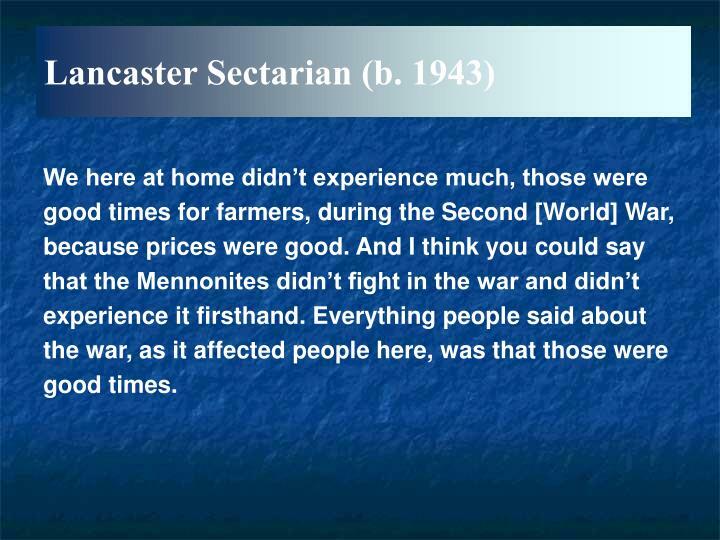 And I think you could say that the Mennonites didn’t fight in the war and didn’t experience it firsthand. Everything people said about the war, as it affected people here, was that those were good times. They got good prices for their crops. Although there were some who had to go serve time in alternate camps. Some were drafted, though I don’t think a very high percentage. Some suffered because of it, not exactly very much, they just had to go away from home. 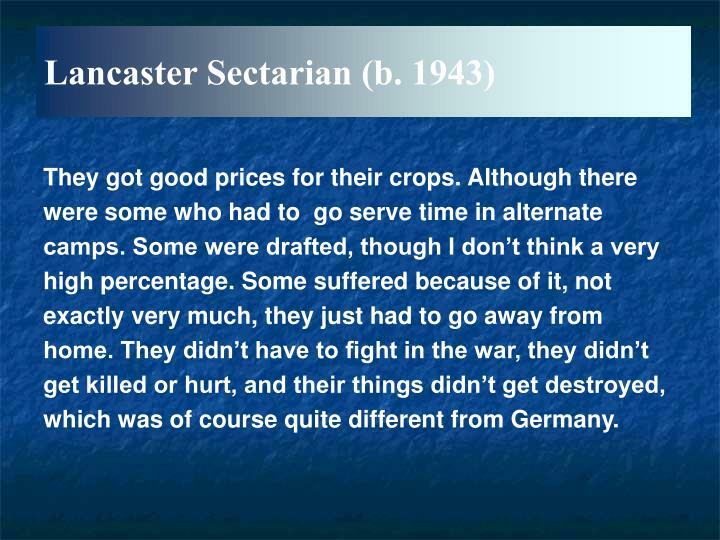 They didn’t have to fight in the war, they didn’t get killed or hurt, and their things didn’t get destroyed, which was of course quite different from Germany. —Have you ever spoken [German] with anyone? Of course I speak with Germans whenever I get the chance. That’s not very often. —How often perhaps in a year? Oh, maybe two or three times. —And for how long then? 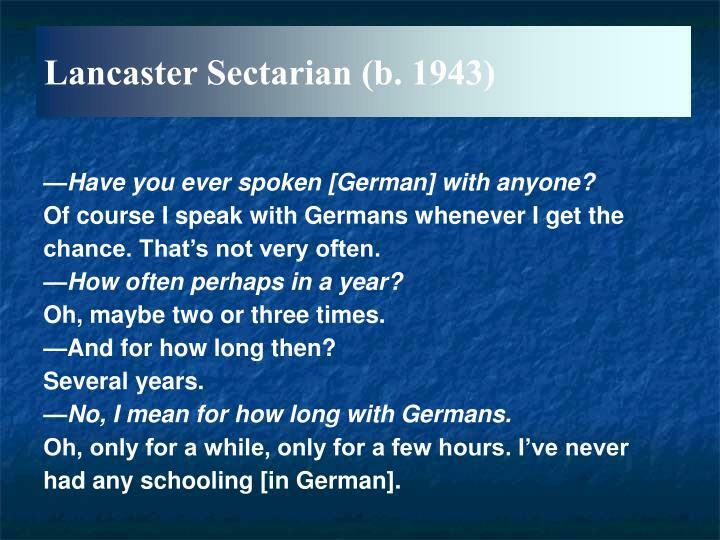 —No, I mean for how long with Germans. Oh, only for a while, only for a few hours. I’ve never had any schooling [in German]. —And pronunciation, where did you learn that? 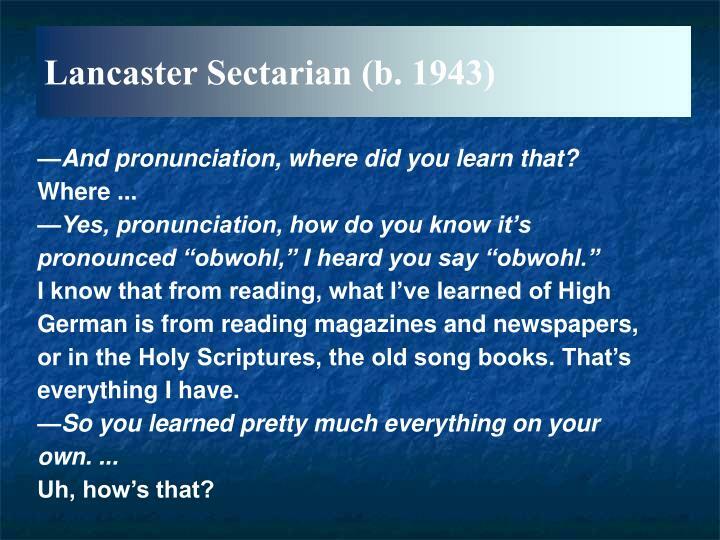 I know that from reading, what I’ve learned of High German is from reading magazines and newspapers, or in the Holy Scriptures, the old song books. That’s everything I have. —Yes, so you pretty much learned everything yourself. You never had instruction in German. 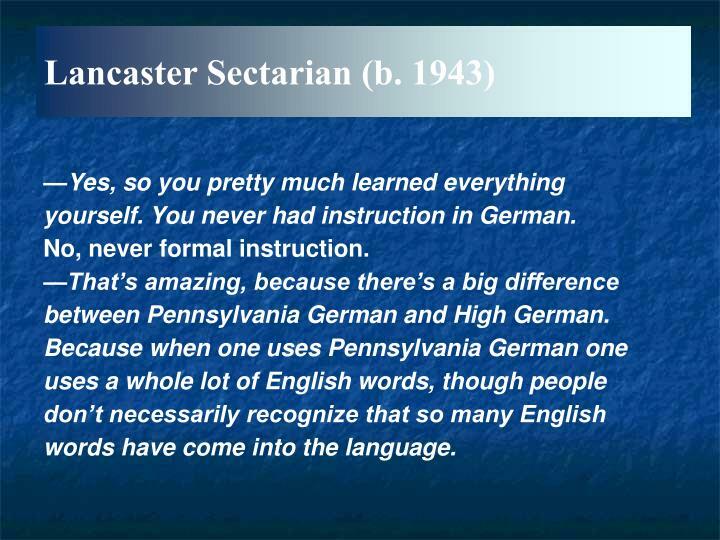 —That’s amazing, because there’s a big difference between Pennsylvania German and High German. 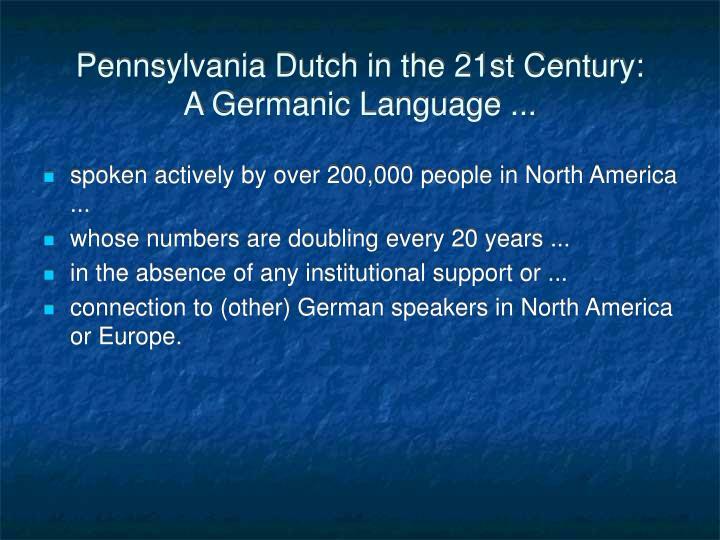 Because when one uses Pennsylvania German one uses a whole lot of English words, though people don’t necessarily recognize that so many English words have come into the language. For us, English is easier. We always read in English, all the farmers’ magazines are in English, all the new machinery, everything is, how do you say it, described in English. With German, one has no contact with German. —And for that reason English becomes more and more powerful. Right, yes, yes, gradually there’s more and more English. 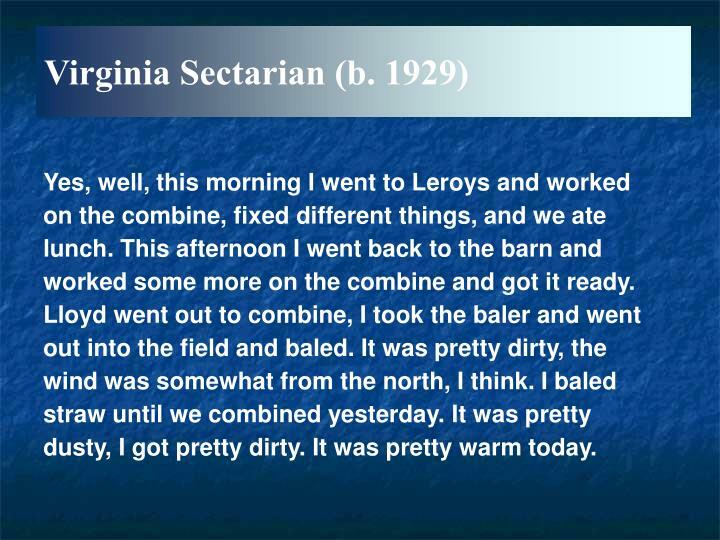 Yes, well, this morning I went to Leroys and worked on the combine, fixed different things, and we ate lunch. This afternoon I went back to the barn and worked some more on the combine and got it ready. Lloyd went out to combine, I took the baler and went out into the field and baled. It was pretty dirty, the wind was somewhat from the north, I think. I baled straw until we combined yesterday. It was pretty dusty, I got pretty dirty. It was pretty warm today. I went home, went to Glendale, fed the cows, two “batches” of cows, mixed feed, fed the cows, came home and washed up, and they told me about this woman who had called about coming and having an interview. I took a bath then and ate supper and soon she was there. Can you understand that?